For a specific Workshop Schedule, go to the ‘Workshops, Training and Conferences‘ area. The CIES offers introductory workshops as well has more in-depth workshops. The introductory workshops are structured to provide the participants with a basic knowledge of the Enneagram, and with a basic framework for understanding ourselves. They also provide an introduction to ways of exploring our experiences; and they give the participants a ‘feel’ for the approach of the more in depth workshops. The following introductory workshops are structured in such a way that they are readily flexible to address your goals, and the goals of your work, school, or volunteer group. The CIES is eager to present introductory workshops that vary in duration, from one hour ‘lunch ‘n learn’ workshops, through to 4-day experiential workshops. The CIES welcomes the opportunity to meet your unique needs, and your circumstances. We have extensive experience in tailoring presentations and workshops to your time availability, to your situation and to your goals. Please contact The Director of CIES, Penny Whillans, to arrange the particulars of your workshop. Join Penny, in this two hour workshop, as she shares her personal experiences of understanding the Enneagram, and as she shares why this system has been so helpful for understanding human nature. Knowledge of the Enneagram has given Penny greater ease with both her psychological and spiritual growth, and it has broadened her curiousity in life, and deepened her compassion for others. This is an interactive workshop, in which Penny shares with you the deepening of relationships, and a heightened appreciation for people’s gifts and challenges that the Enneagram can bring. You will be encouraged to review your self-knowledge, your relationships. You will have an opportunity to ask questions in a safe, supportive environment, and you will leave the workshop with ideas and tools you can take with you on your own journey. This practical and supportive half day workshop introduces helping professionals to the application of the Enneagram system. You will explore the nine personality types, their ‘positive’ intentions, and their addictive patterns. You will look at the Enneagram as a map that outlines how the 9 personalities process and filter information in their efforts to make sense of their world and of common human experiences — and, how, despite ‘good intentions,’ their behaviours can become distorted and even violent. This brief introduction to the Enneagram will significantly affect your client- assessment process, and will aid you in more directly addressing their world views and needs. You will deepen and re-address effective ways of being present with clients, while respectfully working with their psychic structures, thus, directly increasing your treatment effectiveness. Understanding yourself through the lens of the Enneagram will inject ‘new life’ into your treatment process, and forge a stronger connection between the psychological and the spiritual. Penny’s presentation is both relaxed and dynamic. You will be encouraged to explore your questions. This 2 hour workshop explores the usefulness of the Enneagram in approaching the questions we face in everyday life. Particularly, the Enneagram points you to the “how” questions: how you see yourself and others, and how you communicate. You will be given an opportunity to “try on” each of the 9 different personalities of the Enneagram and to engage in discussion about how each tends to inter-relate. You will directly explore how each personality tends to process information, and how very specific information is selected as important. You will recognize your own favoured ways of processing and screening. This workshop will help you to both better appreciate differing ways of viewing the world, and to more practically and realistically listen and speak with active compassion. You will leave this workshop with a renewed appreciation and respect for the humanity in all of us, and with new tools for being present in your daily life. Penny’s enthusiasm and knowledge entertains and encourages self-questioning. Have you ever thought that your work relationships could be improved, or your customer/sales volume increased, if you had a better handle on what makes people tick? This two hour workshop is your chance to get some practical, immediately usable insights on why some people think and act the way they do. The Enneagram is a nine-point system that describes 9 different personality types. Each personality type has identifying characteristics and patterns. You will learn to recognize these patterns and how to identify customers’ needs with more ease. For example, there are those who tend toward following their ‘gut’ when making decisions, while others follow their ‘hearts,’ and others ‘think’ things through. There are those who when under stress, tend to withdraw; others may look for guidelines; still others tend to immediately make efforts to assert themselves to ‘fix’ the situation. 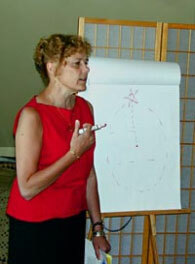 You will be in a relaxed atmosphere, where Penny provides examples, and stories, and where your questions are welcome. You will have an opportunity to explore other personalities’ ways of dealing with decisions and stress. 5. You and the Enneagram: What’s Your Number? Many folks want to know what personality type they are and what this means. In this workshop you have the opportunity to explore this directly. We cut through the sometimes confusing theory to talk specifics about recognizing your personality type. You’ll enjoy “finding yourself” among the 9 types and freely asking questions as Penny briefly discusses the basic positive intentions for each of the types, and also reviews how they can become stuck into dysfunctional patterns. Penny will name and describe the ’sticking places’ for each of the 9 types, and ways to become unstuck are introduced and practiced. Bring your curiosity to this half day workshop. You will have fun exploring. You will learn tools and increase your awareness in ways that will benefit you in your day-to-day activities. Penny is a low-key and very enthusiastic presenter. Her examples and personal experiences will prove as entertaining as they are insightful. Human Beings have so much more which unites us than what divides us. We all yearn for a greater connection to our source. We all want peace, inner stillness, freedom, groundedness, perfection, authenticity, faith in ourselves, knowledge of the universal, and ease with struggles. We all want truth, and joy, and compassion – for our selves, and for our world. The Enneagram shows us that we already know these qualities, and indeed are these qualities. It points us to how we can know these qualities more, and to how we tend to become increasingly removed from them, and thus experience ourselves as lost, frightened, and mired in discontent. In this half day workshop, you will learn how the Enneagram maps out both the patterns that cause us to become stuck in cycles of pain and suffering, and the path to greater awareness. You will re-experience qualities of your true spiritual nature. You will identify ways that you may get stuck in moving away from this awareness. And you will identify how to remember and experience true peace, freedom, authenticity and truth. Click here to contact Penny to discuss your interest in the introductory workshops.